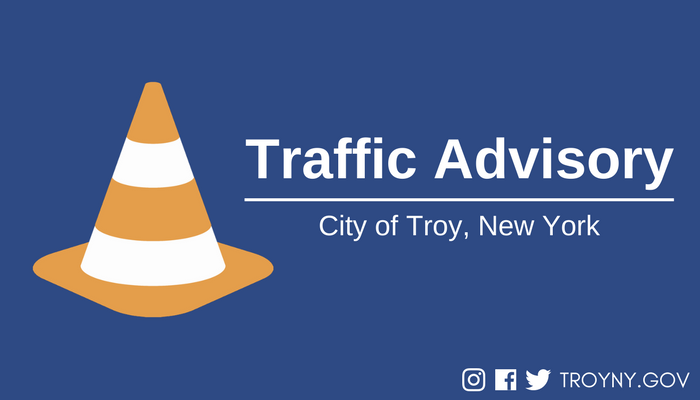 TROY, NY – City officials have issued a traffic advisory for Brunswick Road for scheduled public utility operations. Beginning Saturday, February 9th, east and westbound lanes of Brunswick Road will be closed between Pawling Avenue and Orchard Avenue beginning 7:00am until approximately 3:00pm. Regular vehicles traveling eastbound on Brunswick Road will be detoured to 15th Street, to Tibbits Avenue, to Orchard Avenue. Westbound traffic will be detoured to Orchard Avenue, to Tibbits Avenue, to 15th Street. Heavy trucks (dump trucks, etc.) will be prohibited from utilizing the regular traffic detour. Heavy trucks traveling eastbound on Ferry Street / Congress Street will be detoured at 8th Street to Hoosick Street; westbound heavy truck traffic on Brunswick Road will be detoured at South Lake Avenue to Hoosick Street. Motorists should reduce speeds, observe all posted detours and use caution near work zones to ensure the safety of workers. All businesses in the vicinity of the road closure will be open and accessible. Local emergency services have been notified of the traffic restrictions and road closures.